The US health care apparatus is so unprepared and short on resources to deal with the deadly Ebola virus that even small clusters of cases could overwhelm parts of the system, according to an Associated Press review of readiness at hospitals and other components of the emergency medical network. The results were worrisome. Supplies, training and funds are all limited. And there are concerns about whether health care workers would refuse to treat Ebola victims. 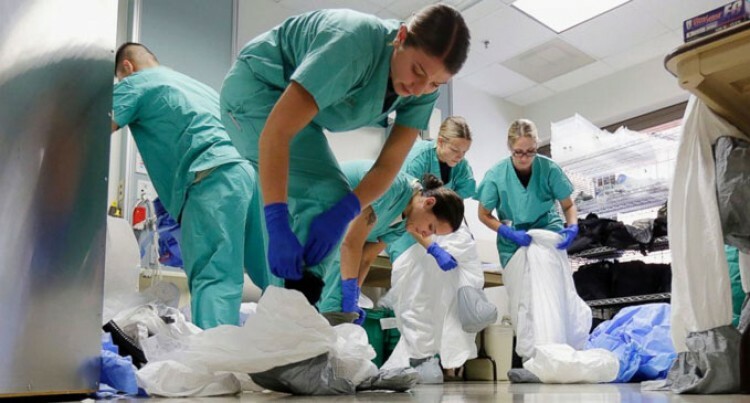 Following the death of a patient with Ebola in a Texas hospital and the subsequent infection of two of his nurses, medical officials and politicians are scurrying to fix preparedness shortcomings. But remedies cannot be implemented overnight. And fixes will be very expensive. Dr Jeffrey S. Duchin, chairman of the Public Health Committee of the Infectious Diseases Society of America and a professor of medicine at the University of Washington, said it will take time to ramp up readiness, including ordering the right protective equipment and training workers to use it. “Not every facility is going to be able to obtain the same level of readiness,” he said. He said better staff training is the most important element of preparation for any US Ebola outbreak. He believes a small group of personnel at each hospital needs to know the best procedures, because sick people are likely to appear first at medium-size or small medical centres, which are much more common than big ones.